Faraway Press: The Online Home of John Jackson Miller: Jackal's Trick audiobook out -- and The Old Republic Vol. 2 from Marvel! Jackal's Trick audiobook out -- and The Old Republic Vol. 2 from Marvel! Tuesday this week marked ten years that I've been writing full-time — and 100+ comics and nine novels (depending on how you count them) later, I'm still at it. This week adds a couple of releases to the shelf — or, rather, one book and one audiobook. 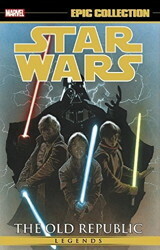 First off, Wednesday sees the release from Marvel of Star Wars Legends Epic Collection: The Old Republic Vol. 2, comprising issues #19-37 of the Knights of the Old Republic comics series — and some firsts. As with Vol. 1, for example, it includes the six "Holofeed"-style in-universe articles I wrote for the series' second year, located exactly where they should be in continuity. Articles include The Admiral's List, the bounty-hunter blog The Adjudicator, and the Taris Holofeed. And then — and I'm really happy about this — the book reprints the Knights of the Old Republic Handbook from 2007 in its entirety. (Yes, including Malak's name-that-really-wasn't, a red herring that was only supposed to be in continuity for maybe a couple of months. That was a couple of months too long!) Best of all, it includes Dustin Weaver's amazing cross-sections of the Last Resort and the Moomo Williwaw, which remains one of the crazier things I've ever seen. The book is available now from your comic shop and Things From Another World; it'll be out slightly later from Amazon and your mass-market bookseller. I'll also have a supply of these available soon in my shop. You can also check out my notes on the issues in the book here. Book 3 will be out a month later. You can find Book 2 at Audible and iTunes. Some quick event notes: over the next few weeks, I'll be at Midsouthcon in Memphis, Galaxy Comics' 10th Anniversary in Stevens Point, Wis., and, yes, at Star Wars Celebration in Orlando. Actually quite a lot of events to report on, so I'll do a longer post on those soon.